“focus on your music, regular practice and perseverance can do wonders"
ITC’s Vivel, in partnership with Hungama Digital Media Entertainment and Indian musician Shankar Mahadevan has launched India’s first truly digital talent hunt – MOBisur. This unique and innovativemobile and internet based talent hunt promises to give every Indian an opportunity to be the next singing sensation of India. T-series is the official music partner. 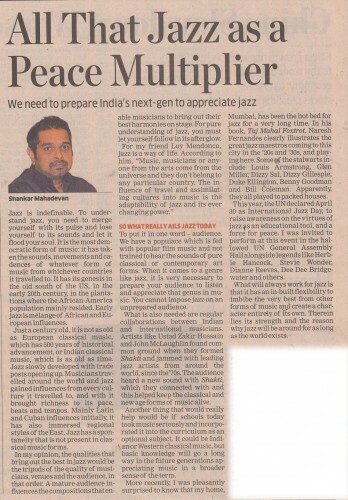 We need to prepare India's Next Gen to appreciate Jazz. this is a small article i wrote in the Economics times 02 June 2012. click on the image to read on. The celebration will kick-off on April 27 at UNESCO Headquarters in Paris with a daylong series of jazz education programs and performances. An evening concert will feature Herbie Hancock, Dee Dee Bridgewater, Marcus Miller, Hugh Masekela, Lionel Loueke, Tania Maria, Barbara Hendricks, Gerald Clayton, Terri Lyne Carrington, China Moses, Ben Williams, Antonio Hart, and others. John Beasley will serve as Musical Director. The daytime events will include master classes, photo exhibitions, film screenings, roundtable discussions, improvisational workshops, and live performances. International Jazz Day will be celebrated by millions worldwide on Monday, April 30 and will begin with a sunrise concert in New Orleans’ Congo Square, the birthplace of jazz. The event will feature a number of jazz luminaries along with Hancock including Dianne Reeves, Jeff ‘Tain’ Watts, New Orleans natives Terence Blanchard, Ellis Marsalis, Kermit Ruffins, Bill Summers, Treme Brass Band, Dr. Michael White, Luther Gray, and Roland Guerin. The worldwide programs and events will conclude in New York City at the United Nations General Assembly Hall with an historic sunset concert certain to be one of the most heralded jazz celebrations of all time, with confirmed artists including Herbie Hancock speaks abt the Event.Herbie Hancock speak about the Event. Shankar Mahadevan, whose trio of Shankar-Ehsaan-Loy is behind hits like 'Senorita' and 'Kajra Re', says reinvention is the key to their longevity. "We have given many compositions which later became the trend in the industry. When we compose music, we always try to bring some new flavour in it. Sometimes, we re-invent ourselves from our existing compositions and that gives us immense confidence to churn out hit music. It's always exciting to create something which is not done before," said Mahadevan. The composer trio started their Bollywood sojourn with Mukul Anand's unreleased film 'Dus' but their effort went unnoticed. They finally had their first hit with Vidhu Vinod Chopra's 'Mission Kashmir'. After that, they have composed music for over fifty soundtrack so far in several languages. "Before forming the group Ehsaan was doing jingles and Loy was writing for television. We started off our career with non-filmi music. Rock, pop and jazz in our concerts." With 'Kajra Re' (Bunty Aur Babli), they started the rage of item numbers and Mahadevan feels that item numbers will continue to rule Bollywood. "Film is all about entertainment and these item numbers are extension of entertainment in a film. They add spice to a film. They are an important part of a film and makes people happy," he said. The trio were in the Capital to perform Seagram's 100 Pipers Shankar Ehsaan Loy - four city live in concert, which ended here on April 1. They are currently busy composing music for Kamal Haasan's bilingual project 'Vishwaroopam'. Set in Tamil and Hindi, Mahadevan has infused Carnatic elements in the movie. "It's a very big project for us. As I have done many Tamil films in the past, I can understand Haasan. I have infused Carnatic classical music in my compositions. First time, there will be a thumri in Tamil. The whole song is choreographed by Birju maharaj and Kamal Haasan is performing it." 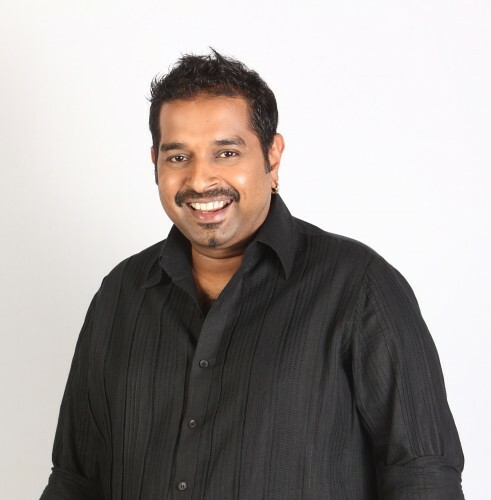 Copyright 2011 Shankar Mahadevan. All Rights Reserved.